Roni Schuetz, a Swiss and Israeli national, is an IT project manager, enterprise architect and software engineer. He works as software engineer with over 18 years of professional experience with scripting and object-oriented languages on multiple platforms. Currently he is mainly focusing on RESTful (ROA) and Service (SOA) Oriented Architectures, Enterprise Software / Architecture and RESTful Web Services in the transportation industry. 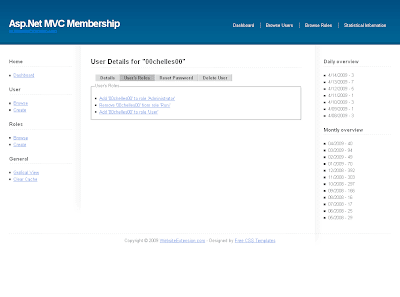 For those people which are using my ASP.NET MVC Membership they getting invited to a google group to discuss issues or suggest features. 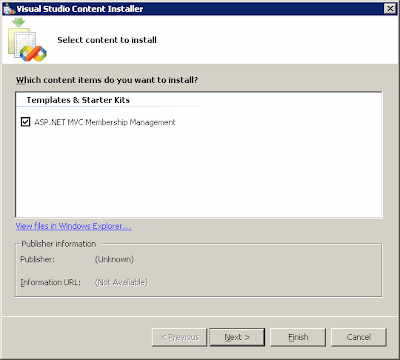 With the release of Microsoft Visual Studio 2005, there is no "out of the box" solution for maintaining the Membership and Role databases in Microsoft IIS. This is a problem when you move your application from development to a production IIS server. The utility that Microsoft provides, ASP.NET Web Configuration, can be run only in a development, non-production environment. Since I'm developing already various open source projects I decided only to share this Visual Studio Content Installer for a donation of 30 EURO - (http://www.ronischuetz.com/donate.html). Once you have donated given amount you will receive an email with the download link. Please notice that any further updates are given out for free. 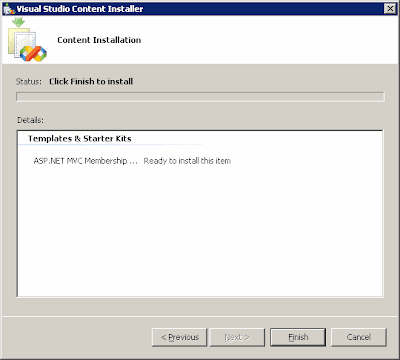 Instructions how to use the Visual Studio Content Installer for Asp.Net MVC Membership Management Template. 1. After downloading the given file you need to extract the zip file and you receive a *.vsi file. Upon double click on this *.vsi file the following screen appears. I decided not to sign it therefore is there no publisher details available. 2) If you use the link "View files in Windows Explorer" an explorer window opens and you should see the following screen. 3) Upon next button you receive the following screen - this happens because I havent added any digital signature. 4) Upon "Finish" the template will be installed. 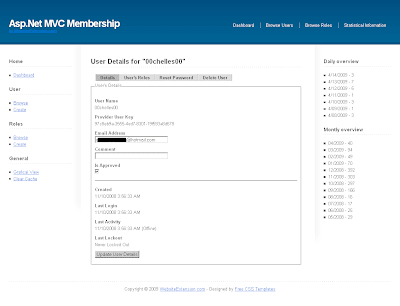 5) The following screen informs about successfully installed asp.net mvc membership template. 6) Open a new instance of visual studio and select under Project Types: "WEB". 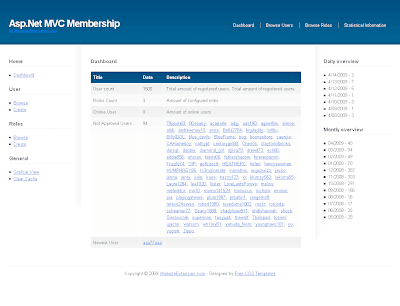 In the section of "My Templates" you find the new installed ASP.NET MVC Membership Template. Enter an application name and select your favorite location. 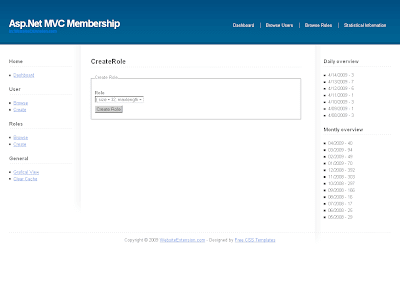 7) As result of the project creation a normal MVC template will be installed with the asp.net mvc membership extensions. All files and folder which are marked with green color are added to the default project structure. 8) from this point you have a runnable asp.net mvc project. 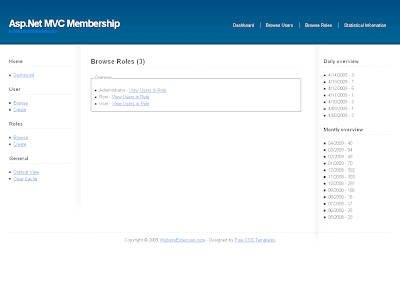 the missing part now is to add a asp.net membership database. If you have already one you only need to update your web.config file to your database. This Software and all information is provided "AS IS" and WITHOUT WARRANTY OR CONDITION OF ANY KIND, EXPRESSED OR IMPLIED, INCLUDING THOSE REGARDING THE ACCURACY OR COMPLETENESS OF THE INFORMATION, WARRANTIES OF MERCHANTABILITY, FITNESS FOR A PARTICULAR PURPOSE, TITLE, NON-INFRINGEMENT AND THOSE ARISING FROM A COURSE OF DEALING, USAGE OR TRADE PRACTICE. It is up to you to take precautions to ensure that whatever you select for your use is free of such items as viruses, worms, trojan horses and other items of a destructive nature. IN NO EVENT I'LL BE LIABLE FOR ANY DAMAGES WHATSOEVER (INCLUDING, WITHOUT LIMITATION, THOSE RESULTING FROM LOST PROFITS, LOST DATA, LOST REVENUE OR BUSINESS INTERRUPTION) ARISING OUT OF THE USE, INABILITY TO USE, OR THE RESULTS OF USE OF, THIS SITE OR ANY SITE LINKED TO this blog or my personal WEBSITE: WWW.RONISCHUETZ.COM or WWW.RONISCHUETZ.NET. WITHOUT LIMITING THE FOREGOING, I SHALL BE NOT LIABLE FOR ANY SPECIAL, INDIRECT, INCIDENTAL, OR CONSEQUENTIAL DAMAGES THAT MAY RESULT FROM THE USE OF THIS SOFTWARE OR WEB SITE OR ANY WEB SITE INFORMATION WHETHER ARISING UNDER CONTRACT, NEGLIGENCE, TORT OR ANY OTHER LAW OR CAUSE OF ACTION. 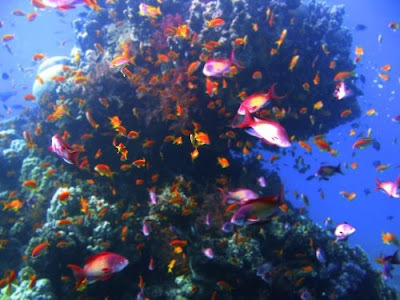 SOME JURISDICTIONS DO NOT ALLOW THE LIMITATION OR EXCLUSION OF LIABILITY. ACCORDINGLY, SOME OF THE ABOVE MAY NOT APPLY TO YOU. You agree to release, defend, indemnify and hold me harmless from and against any and all claims, liabilities, damages, losses or expenses, including reasonable attorneys' fees and costs, arising out of or in any way connected with your access to or use of this Software, Web Site or any Web Site Information. 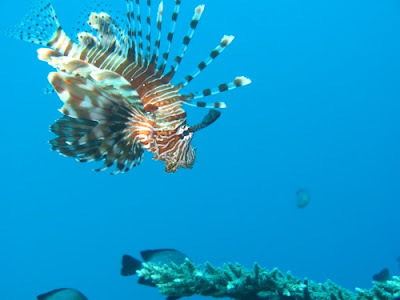 You agree not to import, export, re-export, or transfer, directly or indirectly, any part of this Software, Web Site or any Web Site Information provided on or pursuant to this Web Site except in full compliance with all United States, foreign and other applicable laws and regulations. I created a new project at codeplex which aims to contain a big collection of ASP.NET MVC Action Filters. An action filter is an attribute you can slap on an action method in order to run some code before and after the action method executes. 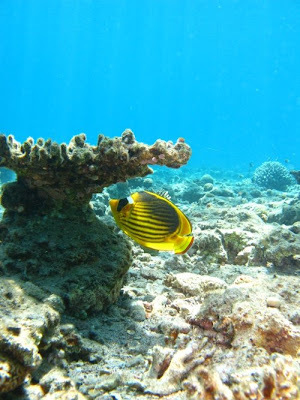 Typically, an action filter represents a cross-cutting concern to your action method. Output caching is a good example of a cross-cutting concern. Hopefully a lot of people will provide their own Action Filters to create one big library which contains dozens of filters. 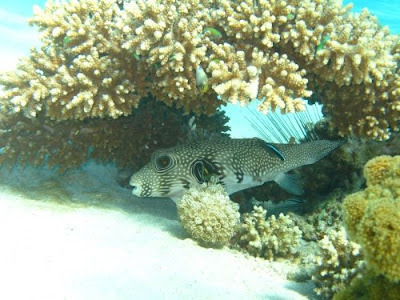 If you have additional Action Filters please feel free to post them at http://mvcactionfilter.codeplex.com/. Notice the ValidateInput Attribute above and the fact that I turned off validation by passing false to it. 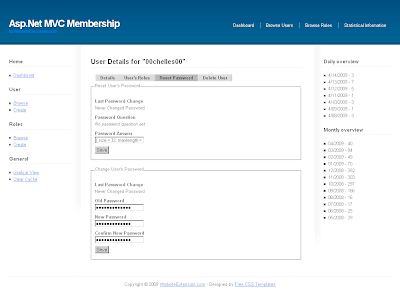 If you look at the source of the ASP.NET MVC Framework you will see that the ValidateInput Attribute is masquerading as an IAuthorizationFilter so that it will be one of the first filters to run when a controller action is run. During the OnAuthorization Method it just quietly sets the controller's ValidateRequest Property to the value you passed to it ( false in this case ). That value of the property controls whether ValidateInput gets called on HttpRequest when the ControllerActionInvoker is invoking the action. 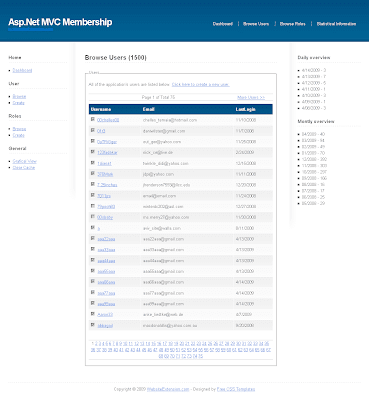 Good stuff to know as you start working with the ASP.NET MVC Framework. 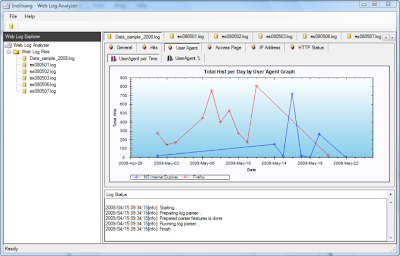 Indihiang Project is a IIS log analyzing tool based on LogAnalyzer. This tool analyzes IIS Web server in comprehensive graphs and reports. 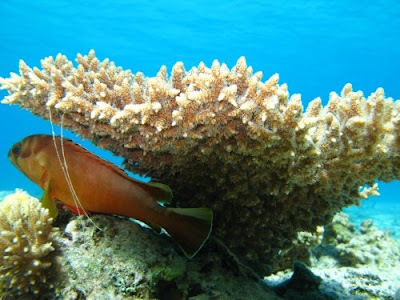 The project is located at codeplex: http://indihiang.codeplex.com/ and makes a very good impression. I could easly analyze IIS Logfiles which have a size of 1.2 GB and a bit more. thanks to ronald for this tip. 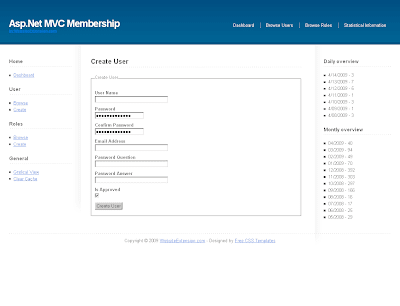 This sources and its associated code solve this by implementing solution to Member and Role management while using standard Microsoft ASP.NET MVC tools. 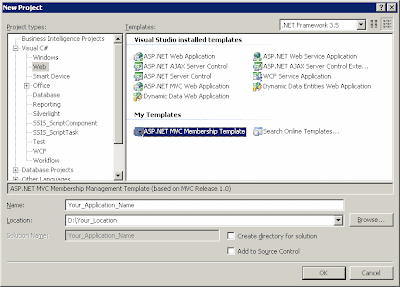 This means that it will run in any ASP.NET MVC 1.0 environment, including IIS. 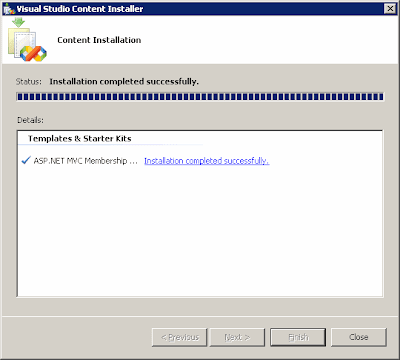 I found 3 projects for membership management were 2 of them are outdated and one is not working with current asp.net mvc release 1.0 (ASP.Net MVC Membership Starter Kit). Some of my code is based on the started kit but most stuff I had to rewrite or make coding changes to make it work with asp.net mvc release 1.0. I'm writing already 2 open source projects therfore I'm not able to share this sources for free and I plan to sell you full source bundle for around 30 EURO. In the meanwhile, if you're interessted in the code you welcome to drop me a line (schuetz [@] gmail [dot] com). Please use this page to donate the amount. 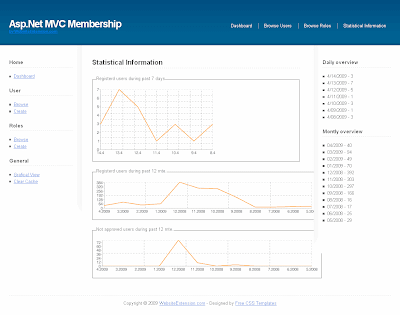 Please notice that MVC is a precondition for this project. INFO: ALL UPDATES WILL BE FREE!! Microsoft this week rolled out the next community test version of a distributed cache platform code-named "Velocity" that promises to speed up .NET-based applications. 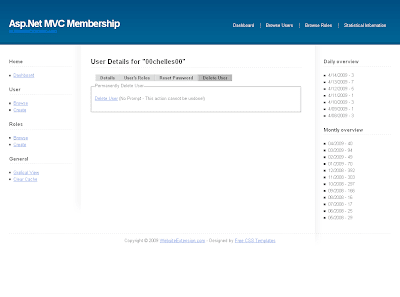 Velocity CTP3 (Community Technology Preview 3) was published on Tuesday and can be downloaded here. The CTP3 represents pre-beta testing; it's of interest mostly to technical reviewers. All information about Shared Cache is available here: http://www.sharedcache.com/. Its free and easy to use, we provide all sources at codeplex. Do you build scalable systems? Micorosft announced "Velocity" - are you gone use it if it cost money?